One of the most memorable photos the Dawn Jogger has from her childhood is a shot of her mother and her wearing sundresses and pop beads (was that the name of those plastic beads that you “popped” into place?) sitting on the boardwalk at Coney Island. That was a long time ago. 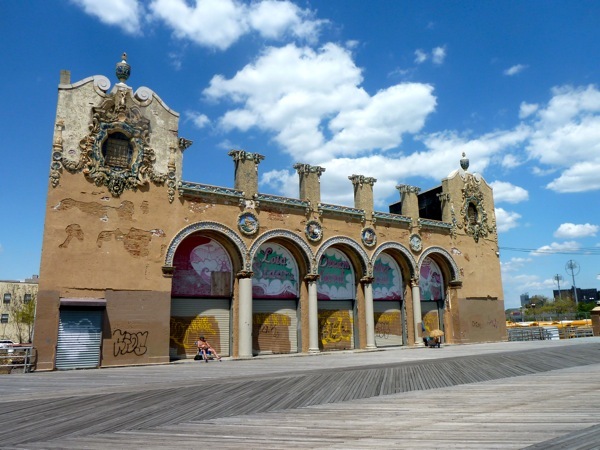 Long enough that Coney Island was still a tourist destination, although the calendar would tell, on its decline. So that’s the back story why the DJ got up this morning and made the long journey from the UES to the tip of Brooklyn. She was kind of hoping that the Cyclones, a minor league baseball team, would be playing in its too cute new park, but admits she didn’t check the schedule. Alas, no game. 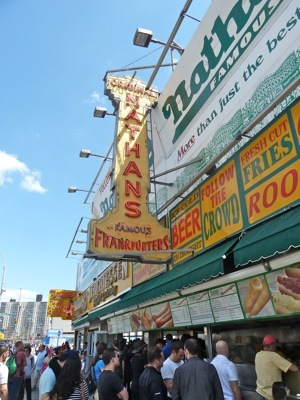 Thankfully, she got there shortly after noon when the line at Nathans hot dog stand just across from the subway station was only two deep. And, as she’s found in her travels everywhere, the 1/2 mile rule was evident – few visitors strolled beyond that distance. The result: the boardwalk was all hers has she walked to the far end at about 33rd St.
Coney Island is a strange place. Nursing homes hug its perimeter. Internet posts warn that “it’s not safe,” although there was no apparent danger on a day that saluted mothers, one that seemed to bring out every ethnic and religious group in NYC. She’s not quite sure when she’s seen such an eclectic assortment of humans, all enjoying the sunshine. Its faded glory (an old roller skating rink with a long sunbather, pictured) was as interesting as its revived amusement zones. Luna Park, in particular, was all bustling and freshly painted.